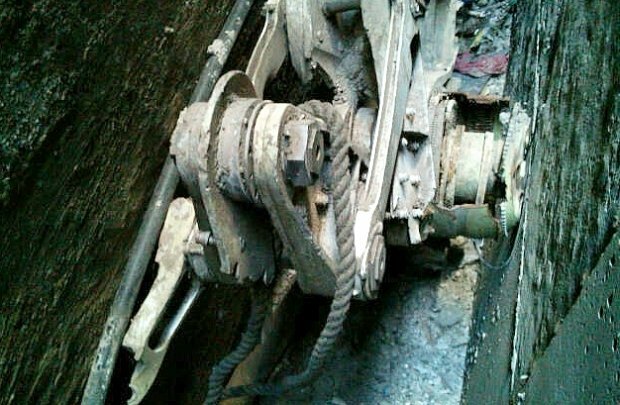 The piece of wreckage uncovered last week and believed to have come from one of the planes flown into the World Trade Center in the 9/11 attacks has been identified as a section of the wing, the NYPD has said. The 5 ft piece was initially identified as a landing gear segment. It was found by surveyors on Wednesday wedged in a narrow, rubbish-filled space 18 in wide. Nearly 3,000 people died in the 9/11 attacks as hijackers brought down planes in New York, Washington and Pennsylvania. Five suspected al-Qaeda militants are awaiting trial for the attacks at a military tribunal at the US detention facility in Guantanamo Bay, Cuba. The plane part, known as a trailing edge flap actuation support structure, came from the underside of the wing, New York police said in a statement. Authorities have not determined which of the two planes the metal piece came from. The NYPDsecured the area in lower Manhattan – between 51 Park Place and 50 Murray Street – as a crime scene after the aircraft piece was found. The location is at the site where a mosque and community centre has been proposed, three streets away from “Ground Zero” – where the twin towers once stood. Police have taken photographs and are keeping the site off-limits until a health assessment has been made by the medical examiner’s office. New York Police Commissioner Ray Kelly has said investigators would scour the space for possible human remains. He said the piece of debris was found at about 11:00 local time on Wednesday by surveyors hired by the owner of 51 Park Place. At 08:46 on 11 September 2001, American Airlines flight 11 hit the World Trade Center’s north tower. Seventeen minutes later, United flight 175 hit the south tower. Although rubble from the attack was cleared in 2002, other debris has been found scattered across the area since. Khalid Sheikh Mohammed is accused of masterminding the attacks while the other four men being held at Guantanamo Bay are accused of providing support for the co-ordinated hijacking. They are charged with conspiring with al-Qaeda, terrorism, and one count of murder for each known victim of the 11 September attacks at the time the charges were filed – 2,976 in total. The five face a possible death sentence if convicted.